A Pizzapalooza crawl confirms our gluten-friendly pizza scene is on the rise | Food and Drink | Style Weekly - Richmond, VA local news, arts, and events. Scott Elmquist Crushed tomato sauce, fresh mozzarella, basil, sea salt and olive oil top a gluten-free crust on the Golden Girl at the Hop Craft Pizza and Beer. Two friends. Three hours. 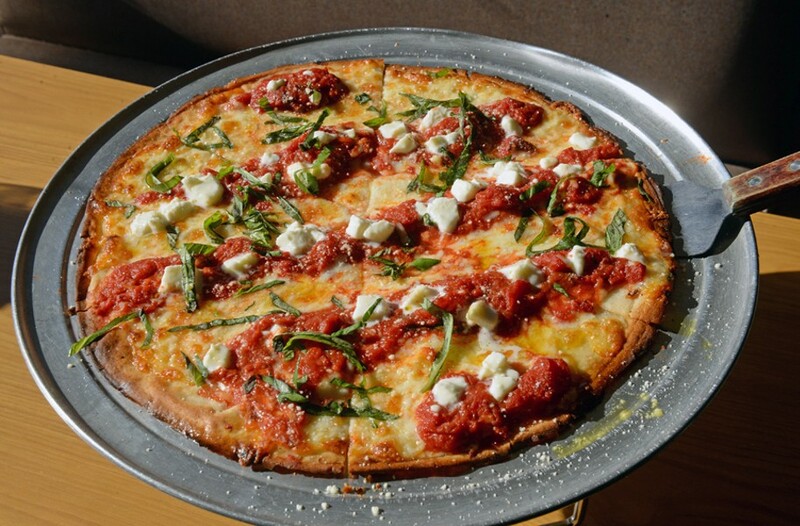 Five Richmond pizza spots that offer up gluten-free eats. This was in no way a scientific or exhaustive study, but there's something to be said for being able to get gluten-free or sensitive slices just miles from each other. These days, a simple Google search results in more than a handful of places that offer such options. However, ask people who have celiac disease or just prefer avoiding gluten for other reasons, and they'll usually express the same sentiment: Just because it's on the menu, doesn't mean it tastes good. Most Sunday afternoons, a friend and I swap texts discussing where we'll celebrate pizza Sunday. Respectfully, I have to look out for my GFF (that's something between a BFF and a gluten-free friend), which means lots of online menu scanning for the blessed gluten-free indicator, bonus if they include what their prep and oven situation is all about since folks with allergies cannot have their pies contaminated. We have our standbys, but we rejoice when we find a new spot with the goods. But why not amp up our game and go on a full-blown mission? Fortunately, there are some seriously delicious pies about town. Some findings were surprising, for better or for worse. One thing that GFF said before we began the journey held true: "It's about the crust, people." "This is my go-to pizza," GFF says. The Kosmic Karma is a red sauce delight topped with feta cheese, mozzarella, spinach, sun-dried and roasted tomatoes, finished with a pesto swirl. It's all atop a signature 10-inch crust from the gluten-free-friendly brand Smart Flour Foods, that's crisp where it needs to be and tender overall. It's priced as a small pie plus an additional two bucks. Mellow is serious about its gluten-free offerings, folks. The menu names all gluten-free ingredients like sauces and toppings, including a few vegan options as well as tofu and tempeh. When you order, the server will ask if you have an allergy so that your food can be prepped in a separate area, complete with cooks who use new utensils and gloves. The biggest and most delish gluten-free pizza we found was the Golden Girl from the Hop Craft Pizza and Beer. It's about 14 inches and loaded up with fresh mozzarella, basil and sea salt, and slathered with hand-crushed tomato sauce and extra virgin olive oil. The crust is unlike any other we've tried, sturdy but floppy in the best way. "It's nice to feel like a normal person and hold a sloppy slice of pizza," GFF says. Did we mention it delivers, and also has a ton of gluten-free ciders to choose from? The menu does disclose that grub isn't prepared in a 100 percent gluten-free environment, but there is a dedicated oven and prep space. At one point, this was the only spot in town GFF said she could get a gluten-free pizza. This Shockoe Bottom mainstay heard feedback early from customers and began serving up gluten-free pies well before the rest, regularly tweaking the menu. What's special about Bottom's Up is that the crust is house-made. It's available for any signature item, priced just like a thin-crust pizza and composed of a blend of several flours, evaporated cane juice, xanthan gum, sea salt, guar gum, egg, olive oil and yeast. The Goat in the Garden offers up a hearty, divine smattering of fresh spinach leaves, Roma tomatoes, goat cheese and roasted garlic. Sadly, the crust doesn't hold up for us. "It's delicious, but there's something about the crust I can't quite describe," GFF says. "It's crumbly and kind of falling apart." There's also a portobello pie option, with two large mushroom caps holding all the goodness, another viable option. Both are available on-site and delivered. These new kids on the block get rave reviews for the cleverly named brick-oven creations, so we were stoked to check out the gluten-sensitive specialties. We opted for the Basic Instinct, a Margherita-style pie with the usual tomato sauce, fresh mozzarella, basil and olive oil. It looked like a pizza, but with a brittle and lifeless crust and minimal cheese, it disappointed. "At least if you are out with a group of friends, there's an option for both food and drink," GFF says. Another newbie nailed it with a unusual spin on a basic Margherita style. While the pies aren't prepared in a 100 percent gluten-free environment, the menu says it makes "it as gluten-free as possible," and an orange icon clearly denotes gluten-free options. Served on a square crust that's light and fluffy, but with the right crunch around the edges and sauce over cheese, this is another keeper. Our knowledgeable server was elated when we ordered it, saying it was hands down one of her favorites, even though she doesn't have any restrictions. She also offered samples of a few gluten-free or reduced ciders that paired nicely with it. Color us impressed. When it was all said and done, we had many questions and engaged an expert. According to Evan Byrne, one of the owners of the Hop Craft, gluten-friendly and gluten-free offerings can be tricky. For one, you can simply run out of the premade crusts when demand is high. Cost also plays into the picture. As he explains, a regular crust, made with raw ingredients, is super-affordable, whereas the GF options are a bit more expensive. "Really though, it's the cost of doing business," Byrne says. "It's just important to be able to serve everybody."